Authorization keys have an associated license count. Usually 1. However, this is configurable. If you purchase more than one key we can consolidate all of the licenses onto a single authorization key. Authorization keys can activate more than one machine. Authorization keys are maintained on our license server. Activation of your software takes place by submitting your authorization key and a unique machine signature (MachineID) to the license server. If activation succeeds a lease token is handed back to the software and will run as long as the token is valid. 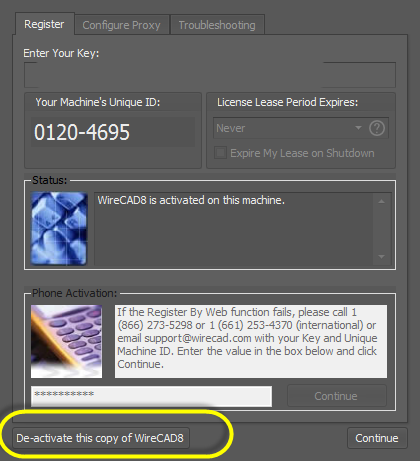 WireCAD can be configured to activate a Never Expire lease. This is handy if you know you will be using WireCAD without a network connection. 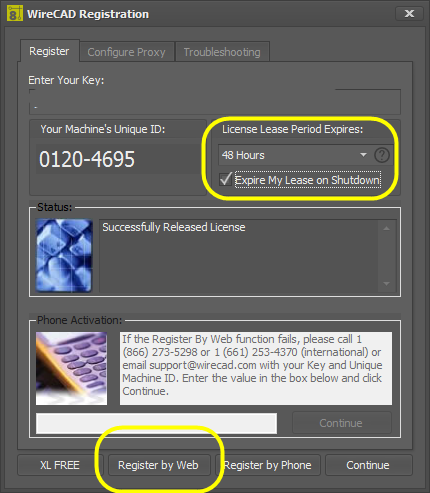 WireCAD can be configured to expire the lease on shutdown. This is the mode to use if you are floating the license between several machines. The Authorization key is missing from the License server. The Authorization key has a license count of 0. We have expired the key due to consolidation of license count or some billing issue. The Authorization key is leased to another machine. The license count is exceeded. Open the Control Software Activation Dialog. If the machine is already Activated. Click the [De-activate this copy of WireCAD]. This will release the lease on the license server and ready the server to receive new information. Set the License Lease Expiration Period to something other than Never. Check the box that says Expire my Lease on Shutdown. Set the License Lease Expiration Period to Never.